Nate Ruess anchors his first solo album by doing what he’s always done best: blowing the roof off the place with astronomically rangy, patently catchy hooks. 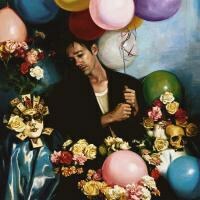 On “AhHa”, the second single from his debut solo album Grand Romantic, Nate Ruess does all of the following things: he laughs obnoxiously four times in a row to open the song, affects a blues growl and an emo snarl, samples a song by his previous band Fun., samples a passage from an E. E. Cummings poem, references his mother, and laughs obnoxiously a final time to close the song. It’s a bit much, but it also deserves applause for committing wholeheartedly to a far-fetched concept in a way that few pop songs in 2015 do. Ruess told Rolling Stone that the idea behind “AhHa” came to him as he heard maniacal laughter emanating from his tour bus while promoting Fun.’s Grammy-winning album Some Nights. Hearing that sound, he “thought it would be interesting to freestyle over the laughing,” a concept that few musicians would likely think to pursue. But that’s always been Ruess’s style -- the bold move, the grand gesture -- and in between these unexpected moments, the singer anchors the track by doing exactly what he’s always done best: blowing the roof off the place with an astronomically rangy, patently catchy hook. “AhHa” works as a punctuation mark -- whether a period or an ellipsis, time will tell -- between Ruess’s work with Fun. and this first solo project. It does so most clearly by sampling the familiar outro from “Some Nights”, “It’s for the best we didn’t listen / It’s for the best we get our distance.” The borrowed line works metanarratively here, for Ruess seems to be suggesting that distance for the Fun. trio will prove a kind of gift, a way of ensuring that their massive Some Nights success won’t be cheapened by a hastily made, probably inferior follow-up. In the two-plus years since Fun. won Grammys for Best New Artist and Song of the Year, distance has in fact been kind to the band: Jack Antonoff is fist-pumping his way around the globe with new band Bleachers, Andrew Dost is writing film scores, and Ruess is, well, freestyling over his own laughter, among other endeavors. That’s not to say that Grand Romantic is all quirks and gimmicks; rather, there’s a clear, purposeful design to the album, revolving largely around Ruess’s altered perspective on love and romance after starting a relationship with fashion designer Charlotte Ronson. The brief opening number “Grand Romantic (Intro)” works as a campy battle cry for the whole album, imploring whomever is listening to “Step right up it’s the grand romantic / All these tragic broken bones". The a capella chorus of voices, soon joined by two additional harmonic parts and what sounds like a church bell, rings drippily theatrical, borrowing tropes from circus ringmasters and madrigal singers alike. As over-the-top as the song may be, its effect is to inject a dose of wry self-awareness into the proceedings early on, almost to assure listeners that Ruess gets how melodramatic he can sound as a songwriter and a vocalist. What’s strange about this establishing shot, though, is the disjuncture between its winking playfulness and the songs that follow, which are largely fueled by straight-on, unironic earnestness. As a case in point, the ballad “Nothing Without Love” could hardly be less sincere or, for that matter, less cool; it revolves around a tired rescued-at-sea metaphor and builds to a keyboard-assisted climax on par with Meat Loaf’s power ballad “Heaven Can Wait”, if the '80s crooner were belting an octave higher. “Nothing Without Love” was likely chosen as a lead single based on its similarity to Ruess’s hit duet with P!nk, “Just Give Me a Reason”, but without the he-says/she-says dynamic of that song, “Nothing” falls oddly flat for all of its instrumental and vocal bombast. It’s commercially unfortunate when a lead single is the least compelling song on an album, but such is the case with Grand Romantic, which rewards a deeper dive even if its lead track triggers nausea. As a pop vocalist, Ruess’s belty head voice is nearly unmatched, and the fact that he doesn’t play an instrument means that he eagerly welcomes the input of his many collaborators. In addition to producers Jeff Bhasker and Emile Haynie, Grand Romantic’s all-star lineup includes Beck, who co-wrote and harmonizes with Ruess on “What This World Is Coming To”, and Jeff Tweedy, whose minimalist guitar solo on “Take It Back” precisely echoes the lyrics’ tone of pained resignation. “Take It Back” stands out as the exemplar of what Ruess is capable of creating when others rein in his flair for the dramatic: over a patient tempo, Bhasker and Haynie cocoon Ruess’s voice within soft piano chords, muted percussion, and some mild radio fuzz, while Tweedy’s solo slices through that atmosphere like a scalpel. Given the song’s restraint, Ruess’s impassioned ad-libs toward the end feel all the more poignant for being well earned; rather than coming on full-force, as the singer is wont to do, the track allows emotions to simmer until Ruess lets his vocal rip in the final minute. Other songs share DNA with earlier Fun. material: built around perky handclaps and a kitschily plunked xylophone trill, “You Light My Fire” recalls the baroque eccentricity of Aim and Ignite, while “Great Big Storm” and “Harsh Light” reach for the anthemic heights of Fun.’s more recent hits “Some Nights” and “Carry On,” with Ruess beckoning fellow sufferers to sing along on chanted lines like “We all got scars". But in each case, Ruess goes full-throttle on the melodrama in a way that he never did (or was allowed to do) with the band. Like albums by any artist with a penchant for bold moves, Grand Romantic isn’t going to be for everyone. But if you happen to thrill at the twinkling eclecticism of the Beach Boys’ Pet Sounds or get misty-eyed when Freddie Mercury soars above his backing choir on “Somebody to Love,” then you’ll likely follow Ruess at least part of the way on this hopelessly earnest, grandiosely romantic excursion.